Full Guide To Computer Programmer Salary: How Much Can You Earn? It is probably safe to say that programming is one of the most sought after professions in today’s world. More and more people choose to study programming, either at a university, after-school activities, online tutorials, or some other way. And that’s not surprising at all – as time goes on, the interest in this specialty is only rising. With so many people trying to become professional programmers, there are surely more than one incentives to do so. 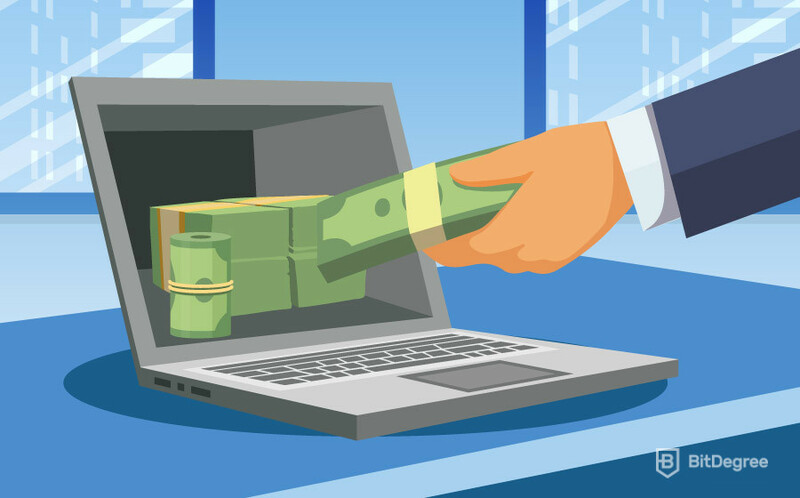 One of the most commonly discussed of such incentives is bound to be the computer programmer salary. In this article, we’re going to take a look at just how much do programmers make – starting from the very beginners all the way to the most experienced ones. Before we start talking numbers, however, we should figure out just what classifies certain programmers as “beginner” or “advanced”. 3 How Much Can You Make as a Programmer? It is common that once you get enough experience in the field, you get a big promotion in your job and acquire a new job title. Programming is no exception – that’s why when you’re trying to figure out how much do computer programmers make, you must first try to narrow down the programmer’s experience in the field. Let’s briefly discuss the different “levels” of programmers that there are, and then start looking into just how much each of them make. Once we’ve covered all of the possible skill levels and their salaries, we’ll be able to extract an overall average programmer salary. Generally, computer programmers are divided into three skill groups – entry-level programmers, junior and senior ones. Entry-level computer programmers are those who have just started getting involved with the industry. These could be the people who have just recently finished university or even just a few online or physical-attendance courses. Entry-level programmers are usually seen as those people who have yet to decide if programming is truly a passion that they want to pursue for the rest of their lives. This is why the usually search for (and get) simple, low-skill requiring jobs. These jobs can include anything from simple maintenance to basic programming tasks. More often than not, they are learning-based – entry-level programmers would get supervisors that would check their work, correct any issues or problems and help the rookies learn in the meantime. Keeping all of that in mind, it is natural that a computer programmer starting salary is going to be somewhat on the low end. That being said, people still talk that as a starting salary, it’s still more than decent, at least when compared with other, similar skill-based professions. Junior computer programmers are probably going to be the group of people that you’ll encounter the most. They are basically the guys and girls that define “programming” as we know it. A beginner programmer “becomes” a junior one once he or she acquires some amount of experience. I’ve put the word “becomes” in quotation marks since there is no specific time frame or achievable goal that would automatically re-classify an entry-level programmer to a junior one. Junior programmers are usually seen as people who have basically already decided on their career paths – all that’s left to do now is practice, practice and again – practice. These programmers are most commonly hired by start-up companies – since they already have some fundamental knowledge and experience in the field, the can be a valuable addition to the team and then further grow and learn with the company itself. A junior computer programmer salary is usually seen as the general indication of what you should expect to earn as a programmer. This isn’t always necessarily the good way of looking at it, though. A “junior programmer” can be anyone from a few years all the way to more than ten years of experience. This also means that their salaries fluctuate quite heavily – it all depends on the before-mentioned experience, place of work, the complexity of tasks, etc. The final category of programmers, senior coding experts are seen as the most influential and time-hardened professionals in the field. 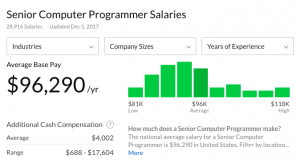 If you want to know how much do programmers make (or, rather, how much they CAN make), a senior computer programmer salary is the best indication of just how far you can go in this industry. These are the people that work in the top-tier companies, programming and creating some of the most advanced programs in the world. They are also the group with the biggest responsibilities, though. Senior programmers, apart from their usual work, are often tasked with managing and curating the less-experienced team members, solving complex tasks that no one else is capable of figuring out, participating in various different side-tasks, etc. Again, you should keep in mind that when it comes to a computer programmer salary, these people make the big bucks. How Much Can You Make as a Programmer? With all three of the big groups of programmers covered, we can now finally transition to the actual numbers. We’ll go through the average programmer salary of each of the groups covered above, and try to figure out if programming is really the such a great career path as it’s made up to be. As I’ve mentioned earlier, even though entry-level programmers make the least amount of money in the field, their salaries can still be considered more than decent. Just HOW decent, you may ask? Well, according to ZipRecruiter, the average computer programmer starting salary turns out to be around $52,000 USD per year. This equates to be a bit more than $4300 USD per month. Given this information, it now becomes quite obvious for why people say that even the computer programmer starting salary is something that should be strived for. If you keep in mind that the average salary in the US is somewhere around the $3700 USD per month mark, then programming suddenly does seem like an amazing opportunity to earn more. 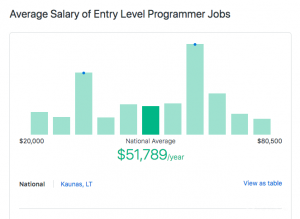 Junior programmers probably have the most diverse salaries of them all. As noted above, this is mostly because of just how broad this group of programmers is. 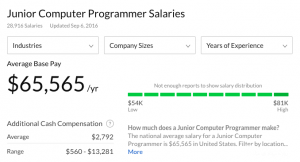 According to Glassdoor, the typical average junior computer programmer salary should be somewhere around the $65,500 USD per year mark. This turns out to be more than $5450 USD per month. All things considered, this can be seen as a great salary – it’s quite far above the overall average salary of the whole of USA. However, since the term “junior” is as broad as it is, this number can fluctuate heavily. Some companies choose to pay more, but also give out more difficult and skill-requiring tasks, while others pay a smaller salary, but compensate the junior computer programmers with various lessons, seminars, and so on. Finally, there’s the senior computer programmer salary. This is actually the number that a lot of people give out when they get asked how much do programmers make. This number can also be seen as one of the main motivations for people to get into programming and study it day and night, just to become better at this skill and one day become a senior programmer. Senior programmers are estimated to make an average programmer salary of around $96,000 USD per year, or $8000 USD per month! This comes out to be more than double the average salary of the nation! This is completely understandable, though. First of all, good and reliable programmers are constantly on demand, and where there’s a high demand for something, there will always exist a competitive pay. Furthermore, as I’ve already mentioned earlier, senior programmers usually work on a few big tasks at once – this can be considered as a big factor when it comes to a senior computer programmer salary. Now that we’ve covered the salaries of all three different skill groups of programmers, let’s get an average estimate of just how much do programmers make. So, beginner programmers make around $52,000 USD, junior coders make around $65,500 USD and the experts earn a hefty $96,000 USD. This comes out to be $213,500 USD. If we divide the number by 3, we come out with around $71,100 USD per year, or $5,925 USD per month. So… what does this mean? Well, first of all, it is obvious that this number is closer to the beginner salary than the senior computer programmer salary (if we’re taking the junior salary as the baseline). This means that, speaking very generally, there’s a bigger gap of skill and the amount of money companies are willing to pay between the junior and senior programmers than the beginner and junior ones. However, with that said, it is still pretty clear that an average programmer salary is definitely a point of attraction when it comes to choosing programming as a career path – it’s significantly bigger than the average salary in the USA. A lot of the times the question of how much do computer programmers make turns out to be the only focus of a conversation around programming. This shouldn’t be the case, however – programmers tend to have a lot of other job benefits, not only a great salary. Once you learn programming, a lot of opportunities for both company-based and individual career paths unlock. Since coding, in general, is a quite broad skill to possess, you could choose to work with anything from software development all the way to computer game creation. That’s why programmers usually specialize in some specific area of the industry – it depends on your interests, skills and, quite frankly, job opportunities. A great place to start off working as a programmer is some sort of a greenfield project-based company. Usually, these companies allow you to both develop your skills as a specialist of your craft and be creative at the same time. Furthermore, you can expect other different benefits, such as paid holidays, bonuses for more difficult tasks, birthday prize wheels and so on. You also have the option to work on solo projects. If you manage to create and develop an app or perhaps even a game that would attract the attention of potential customers, you might be on the path of earning an even more amazing living than one presented and described in this article. Whatever the case might be, it’s important to stress that a great computer programmer salary isn’t the only thing that programmers can expect out of their career paths. With technology advancing at an incredible rate, it’s tough to imagine what other interesting and challenging tasks programmers might face in the future. Now that we’ve covered the computer programmer salary that you can expect to receive when you enter the industry, let’s have a quick recap of the information that we’ve covered in this tutorial. The programmer profession is at its peak of popularity, and the interest in the field is still growing. The most commonly referenced reason for this growth is the computer programmer salary – it is widely known and accepted that programmers make a great living. 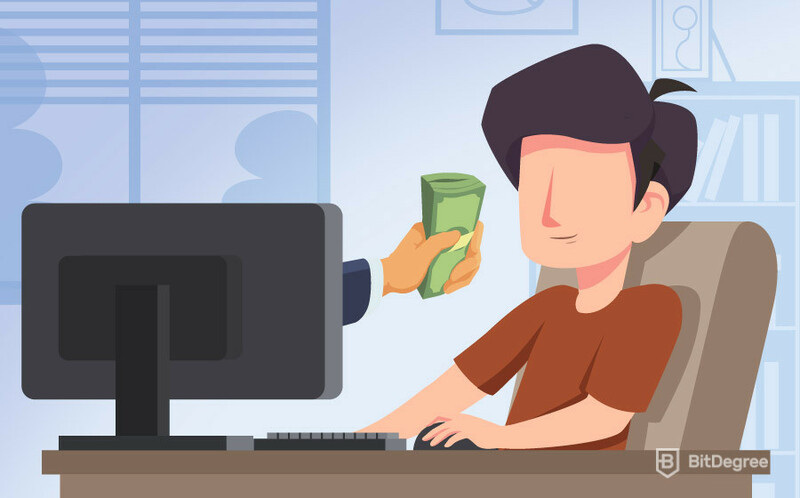 The fact of the matter is that even if you’re just starting out as a beginner programmer, you are still able to earn a great salary. Surely, it’s very context-dependent (both when it comes to your skills and your place of residence), but the general consensus is that the computer programmer salary can always be considered to be above-average. A great salary isn’t the only thing to look forward to in the field of programming, however. Companies offer great benefits for people who are passionate about what they do, and have their minds set on constantly improving in their craft. Programming is a field where the sky is the limit. The possibilities are endless, and there’s always room for improvement. In turn, the more you improve and advance your skills, the bigger the computer programmer salary you can expect to receive. With that said, I hope this “Computer Programmer Salary” article answered all of your questions on how much do computer programmers make. If you decide to choose the path of programming, I wish you the best of luck in your career to come!